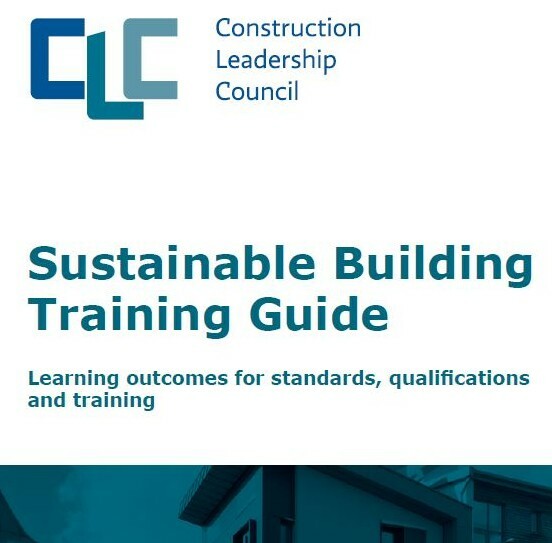 The Green Construction Board (GCB), sustainability work stream of the CLC, has released a new guide explaining the principles of sustainable building to support the training sector to embed sustainability within all mainstream learning. The Sustainable Building Training Guide explains the principles of sustainable building in terms that are useful for the development of content for standards, qualifications, and training courses, including the national curriculum, apprenticeships, degrees and professional qualifications. The guide has been endorsed by leading construction businesses and industry federations, training bodies and professional institutions. Rob Lambe, Managing Director of Melius Homes and Chair of the GCB Knowledge and Skills task group, said “It is essential that sustainability is fully embedded in all mainstream learning and training, and it is great to see how positively this guide has been received across the industry, with key stakeholders not only endorsing the guide but committing to take steps to ensure it is implemented”. The publication, use and uptake of this guide is a key recommendation of the “Each Home Counts” review. The adoption and use of the new guide by the training sector will help us to address the “Performance Gap” and will ultimately aid the transition to energy efficient and low carbon built environment. Mike Putnam, UK President and CEO of Skanska and Chair of the GCB, said “One of the greatest challenges we face in delivering our carbon reduction targets is ensuring we have a properly skilled and knowledgeable workforce”. He added “I believe this publication provides a helpful guide to all those involved in the development of standards, qualifications, apprenticeships and training courses. I would like to thank all those that have contributed to this guide”. The GCB will be working to support the integration of these learning outcomes across built environment training.